Over the past few years, the United States economy has been “recovering” from the worst economic crash since the great depression. On paper, this recovery has been going well, as unemployment is decreasing and the stock market is now at all-time highs. Unfortunately, these metrics only show a partial picture of the economy and a deeper analysis of the facts is far less bright. 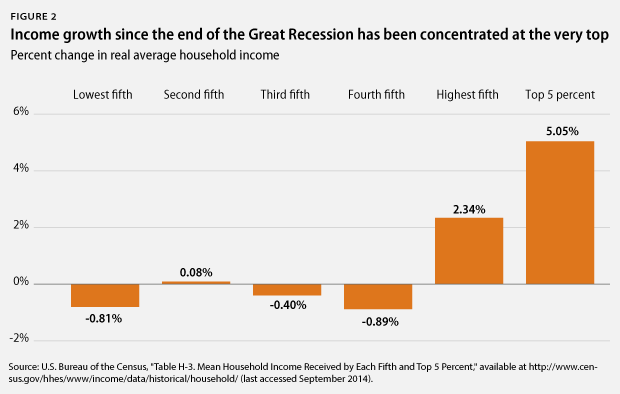 To begin with, most of the economic gains since the great recession ended have been concentrated in the very top income brackets. In short, high-income earners have seen their wages increase at a very healthy rate, but the poor and middle class are actually losing ground. As you can see in the previous graph, the top 5% of earners have seen their incomes increase by over 5%, while the bottom 80% of earners are now making, on average, 0.505% less than they were making before the “recovery” started. Because of this, a more accurate way of describing the post-2008 recovery would be to call it the investor rebound. If incomes are concentrated at the top ends of the socioeconomic ladder, then aggregate demand decreases and the economic system becomes unstable. The rich can invest abroad, while the poor are forced to find scarce jobs domestically, earning low wages to serve a population that has no buying power. Unfortunately, the income inequality issue is a short-term manifestation of a much longer-term phenomenon. 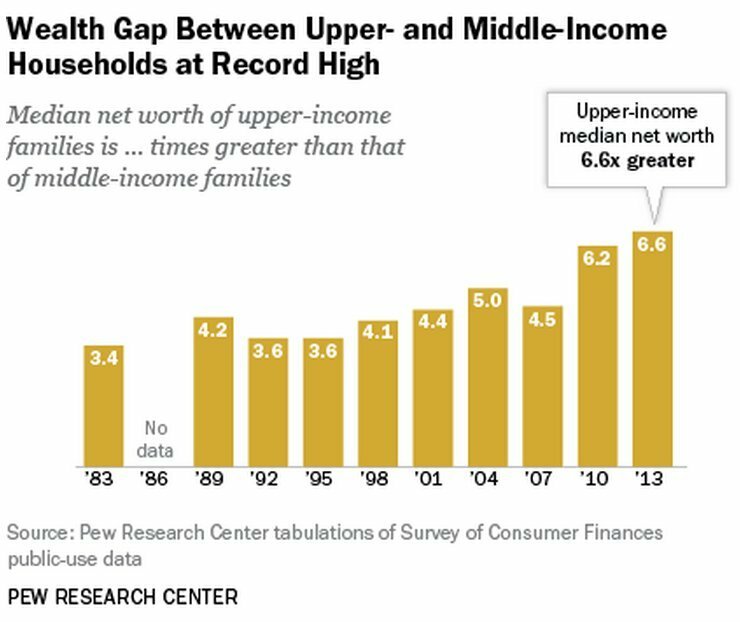 The wealth (income – costs of living for families, accrued over years) gap in the United States has grown to extreme proportions. As you can see in the previous graph, the wealth gap is larger than it has ever been in recent memory. This means that the rich are accruing wealth far faster than the middle class and there is no sign of this trend slowing. To put this into perspective: six members of the Walton family (the founders of Walmart) now have more wealth than the poorest 100 million Americans combined. The growing wealth gap is fueled by a combination of income inequality, the regressive tax loopholes that allow the rich to avoid paying taxes (usually legally), the elimination of middle-class jobs via outsourcing, and the elimination of union power that allows employers to exploit workers. 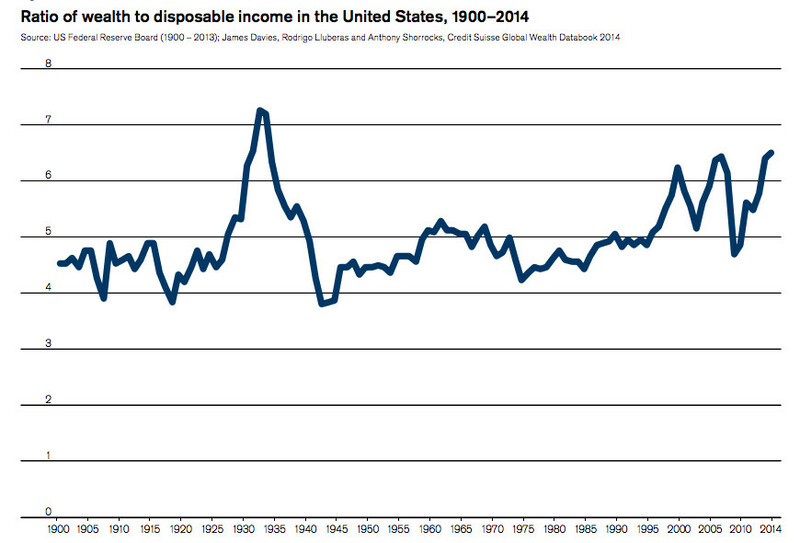 The following graph charts the ratio of Americans’ wealth to their disposable income (income after all necessities are taken care of) over the last century. As you can see, the ratio of wealth to income is now higher than at any point since just before the Great Depression. While it may be difficult for most people to recognize the dangerous message of this graph, it is actually very simple: if you look at the spikes in the graph, where the wealth/disp. income ratio increases dramatically above the stable range between 4 and 5, you will notice that they each correspond to market crashes. In the 1920s, the giant spike corresponds to the Great Depression, while the two complete spikes in the modern era represent the tech bubble bursting and the 2008 great recession. Conversely, the long and stable period from the 1940s to the late 1990s represents the great period of American growth. In short, spikes in this ratio are the harbingers of extreme economic turbulence. They represent dramatic increases in inequality that cause instability in our country’s economy and an inevitable crash. Currently, our country’s “recovery” has us in the middle of a steep increase in this ratio and, if history serves any guide, we will soon face another great recession, if not depression. 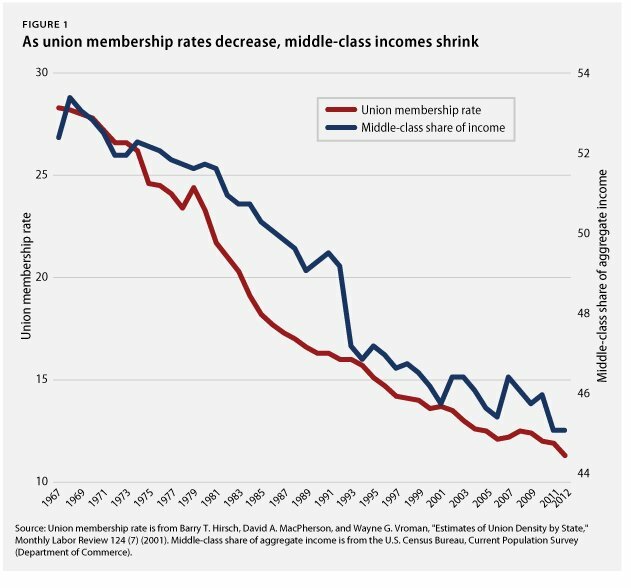 If we want to avoid this crash, we must immediately begin smoothing out the income ratio by forcing employers to start increasing worker compensation (ex. increasing the minimum wage) while using taxation to redistribute wealth downward and ensure increased opportunity for upward economic mobility. We must begin rolling back the regressive reforms of the late 20th century and transition our economy from one that resembles the roaring 20s to one that is closer to the post-Depression prosperity. Good factual evidence. And while some folks may want to claim that this income inequality is due to some imaginary “market forces” the truth is just the opposite. The income inequality is a direct result of tax policy that favors investment overseas over investment at home. And a tax policy that encourages the accumulation of wealth in the hands of a very small minority as opposed to one which encourages the distribution of wealth along the entire spectrum of economic classes. The massive tax code is loaded with giveaways to the wealthiest sectors of the economy (like the oil industry, retail giants), which in turn provide the funding for Congress to maintain their seats in government. Bribery, plain and simple. I am not sure how, with the current system of government in place, that this can change. Even now we see Congress starting to take apart Dodd-Frank and looking to deregulate across the board. At the same time keeping wages low for working people. The system may be broken beyond repair. Agree on the article and comment, but before meaningful tax reform can be accomplished, there must be many more voices such as Senators Elizabeth Warren and Bernie Sanders. To accomplish that, campaign fiance must be reformed. The American people keep self-flagellating by continuing to vote against their own interests, or not voting at all. While the antidote to the problem as outlined above is pertinent and true, in my opinion, there may have to be another crash before enough say “Enough!”. Two upcoming years of Republican/Conservative/Tea party leadership may well pave the way for exactly that. And then, the long slog back to a more equitable division of wealth.